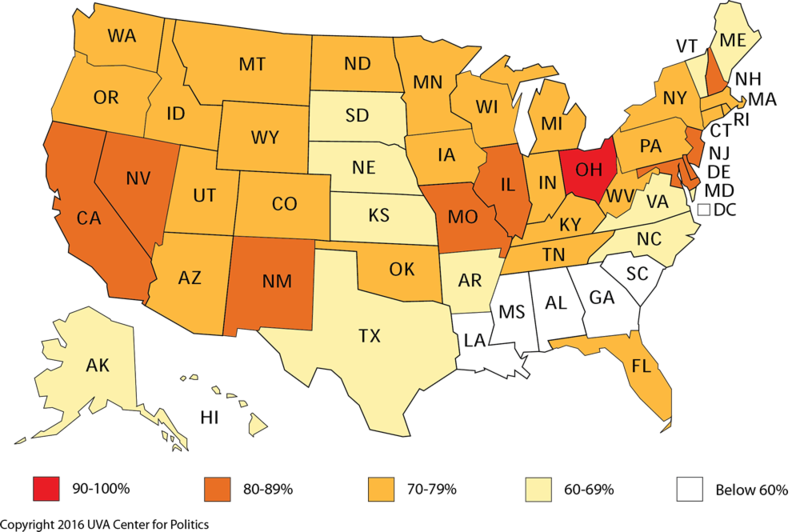 Ohio has retained its title as the state that has most often voted with the presidential winner over the last 120 years, even though it took a strong turn toward the Republicans this year. The Buckeye State voted for the winner for the 29th time in 31 elections this year, the best record of any state since 1896 (I explored the state's presidential voting history in my book, The Bellwether 1). The full results from the states over that time period are shown in Map 1 and Table 1. We chose 1896 as the year to begin this analysis because that election is often cited as a key realigning campaign where Republicans broke open a streak of highly competitive elections and became a majority party for most of the following three decades. If one started in 1916, looking at just the last 100 years of elections, Ohio and Nevada would be tied at 24/26, with Missouri and New Mexico at 23/26 (and Florida, the most competitive of the nation's mega-states, at 22/26). Notice that of the 10 states that have voted with the winners more than 80% of the time since 1896, Clinton carried eight of them -- Ohio and Missouri were the exceptions. Many of these seeming bellwethers misfired in this election. But so did Ohio, given that Trump ran about five and a half points better in Ohio than he did nationally (51.7% in Ohio versus 46.2% nationally), meaning that Ohio wasn't very close to the national average -- the last time it voted so far from the national popular vote was 1932. So its reputation as a bellwether took a big hit in this election despite its vote for the winner. The states that voted closest to the national average (Clinton currently leads the national popular vote by two points) were Minnesota (Clinton +1.5), Nevada (+2.4), and Maine (+2.7). The closest states that Trump won were Michigan (0.2), Pennsylvania (0.7), Wisconsin (0.7), and Florida (1.2). As Donald Trump prepares (presumably) for his reelection campaign, and Democrats begin thinking about where to battle him, these states -- as opposed to historic bellwethers like Ohio, Missouri, Illinois, and New Mexico, all of which voted relatively far from the national average this year -- probably merit the most attention.